A connecting rod is an important engine component that transfers reciprocating motion of the piston to the rotary motion of the crankshaft. Connecting rods are commonly made from iron alloy and are designed to withstand dynamic stresses from combustion and piston movement. Connecting rod connects piston and crankshaft. 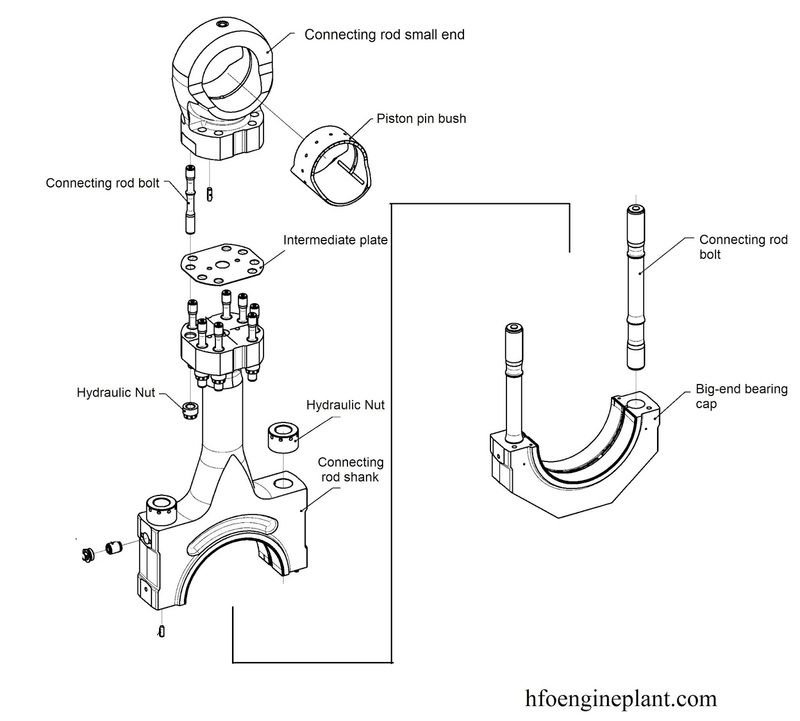 Generally, connecting rod for big engine designed three parts. Connecting rod small end, shank and big end bearing cover. The small end of the connecting rod connects to the piston with a piston pin or gudgeon pin. The piston pin is locked by retaining ring at both ends. Piston pin provides a pivot joint for the connecting rod. Piston pin bush pressed installed inside small end of connecting rod. The big end of the connecting rod connects to the crank pin journal to provide a pivot point on the crankshaft. Connecting rid shank and big end bearing cap hold big end bearing upper and lower shell around crank pin with connecting rod bolt. 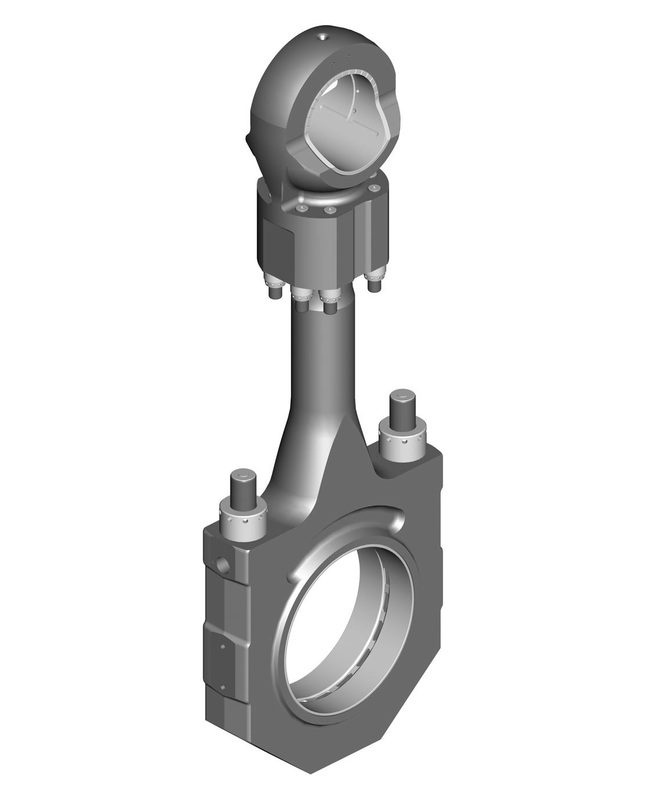 The connecting rod has a parting line between the connecting rod eye and the big-end bearing. When retracting the piston the big-end bearing need not be split. Moreover, this design reduces the height required for piston removal. The piston pin bush is a pressed fit. The connecting rod is a three piece-piece design to allow removal of the piston and connecting rod. The connecting rod is forged and machined with round sections of alloy steel. All connecting rod bolts are hydraulically tightened. The big end bearing and gudgeon (piston pin) pin bearing are of tri-metal design. Between the upper part of connecting rod (4) and big end (6) there is a compression shim (5). 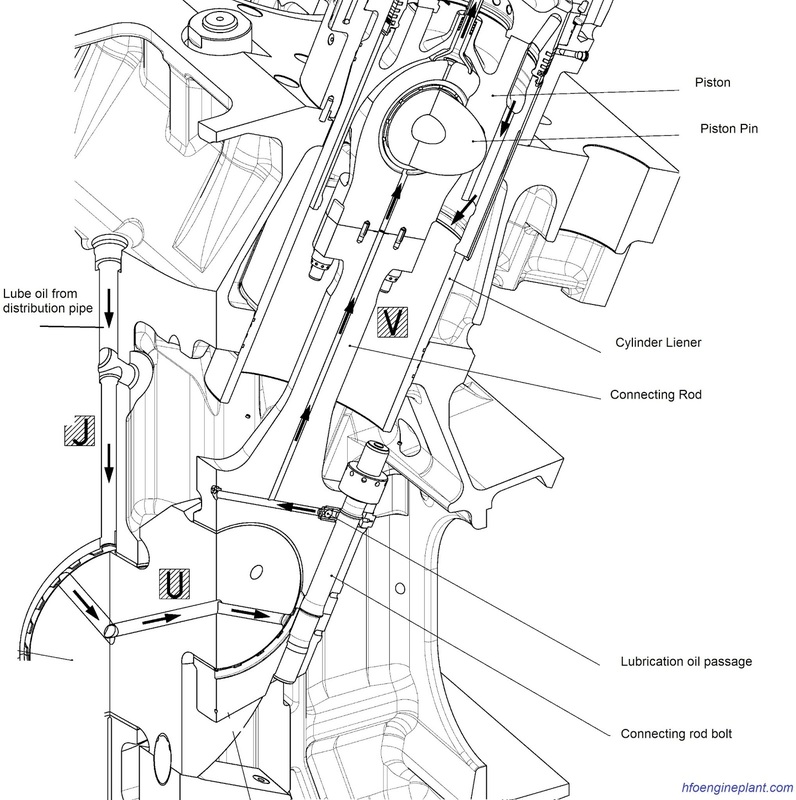 Oil is led to the gudgeon pin bearing and piston through a bore in the connecting rod. The connecting rod is usually made of medium carbon or cast iron steel alloys like 42CrMo4, C-70, EN-8D, SAE1141, S.G.Iron, etc. depending on the engine size. The connecting rod is manufactured by either drop forging or by casting. Lubrication of connecting rod is carried out through the shank bore in running throughout the shank length. The lube oil flows to the big-end bearings through inclined holes in crankshaft and from there through the holes in connecting rods to the piston pin bearings and onward to the cooling chambers of pistons. Convert reciprocating motion of piston into rotary motion of the crankshaft. 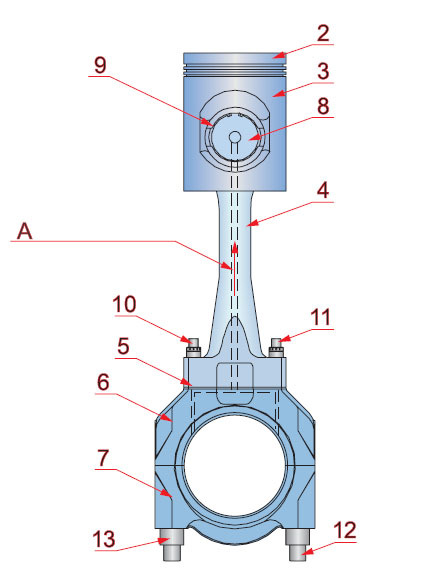 There is a heavy axial loading on the connecting rod because of the combustion gas pressure. There is increase of peak pressure cause abnormal stress on the connecting rod. If the piston seizes the connecting rod can deform. Another cause of connecting rod failure or damage due to water in the combustion chamber. Because water is in-compressible fluid. Smooth movement of the piston in the cylinder liner by proper lubrication and schedule maintenance of piston and rings.